Social Pet Saturday: You've Got Mail! This week, we've been preparing for "back to school". School is starting Monday and we're almost ready! Just need to go shopping for some shoes this weekend and we'll be good to go. Thankfully, Shiner won't have to stay at home all alone once school starts up this year since I'm now her stay-at-home mommy. Today, I have some announcements and posts from other blogs to share. One announcement in particular is pretty important so I think I'll start there. This weekend, all of our email subscribers will be transferred over to MailChimp. Now that I have more experience using MailChimp with my other blog, I feel comfortable making the switch from Feedburner. So, what does this mean for you? Our emails will now be sent out 3 times a week instead of daily. You don't need to sign up again if you're already subscribed via email. And if you aren't subscribed by email yet, you can sign up here and receive emails when new posts are published. Also, you should enjoy the "pretty" look of the new MailChimp updates. The very first MailChimp email update should be sent out on Monday. If anyone notices any mistakes or strange happenings, please let me know! Thank you! So now that the important mail update is out of the way, let's move on to some other news! 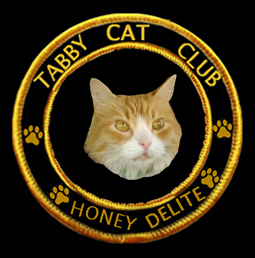 Honey Delite is a new member of the Tabby Cat Club! You can read her introduction post to the club here. Check out her fancy new badge below. Congratulations to Janet K. from Wag 'N Woof Pets on winning our giveaway for a Do-G-Bag from liveloveandbark.com! 150 Punny cat names... and counting - This hilarious post from I Still Want More Puppies has some great cat name suggestions like "Hairy Potter" or "Cindy Clawford" plus 148 more names that will make you laugh your tail off. Senior Pets Should Be Cherished, Not Discarded - This post from The Lazy Pit Bull is a little sad, but it has a great message. The thing I hate about being a veterinarian - This post is from HSTDVM and is also a pretty sad read, but it is just a small glimpse into the not so fun side of the veterinary world. Remember when I asked you to vote for Shiner in the Snouts In The City "Snout Style" photo contest? Well, Shiner did not win first place in the contest but she did win 2nd. There was still a prize for 2nd place which was the awesome t-shirt pictured below. Thank you for your votes! 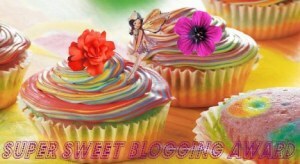 Super Sweet Blogging Award - Thank you so much to SlimDoggy for this super sweet award! If you've never heard of SlimDoggy, stop by his blog and check out his cool phone app which is a great tool for keeping your dog healthy and in shape. Stay tuned next week if you'd like to see some flashback photos of Shiner as a young lady. There may also be some lovely felines of my past on the blog too. We'll also have a special post about ferrets. Have a great weekend everyone! Great round up and my Dad is still laughing at that picture! Mol - glad he likes it Brian! Congrats to both Honey Delight and Shiner! Very cool kitty club badge! 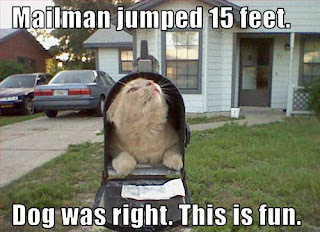 This picture is great - I will look out for the post-guy! Congratulations to this super sweet award, I think I'm hungry now. Have a great weekend and I hope your daughter has a wonderful first day in school on monday. Thank you Easy. We went and did the shoe shopping today. She picked out some really cute boots! And we met the teacher last night. Congratulations on your award and looking forward already to Shiners' Flashback Friday. That is good news for Shiner, that she doesn't have to be home alone now when school starts back up! I love the days when I get to be home with the dogs. I'm so excited I won the Do-G-Bag! Thank you, Ann, and liveloveandbark! I'll be sure to be showing it off in a future post. I think Shiner used to get pretty bored when me and my boyfriend both used to work. Congrats on winning - I know you'll love it! ConCats on your award :) Tigger is also a new member of the TCC, but he hasn't been introduced yet officially!! I saw that :) Tigger is such a handsome kitty. I wonder if he will post for the event on Monday? Congrats for your rewards! 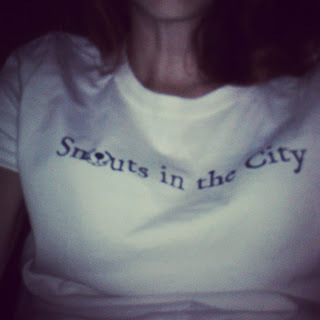 I love that Snouts in the city t-shirt you won! Looks great! Congrats on your award! Great t-shirt! Congratulations on second place and shirt!